My sister and the kids and Dad came for a roast lunch and then we went to the park for a short but muddy walk. 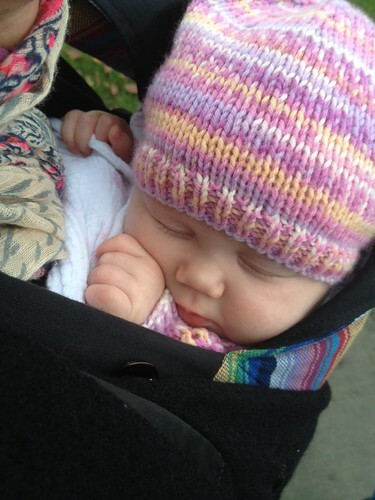 The Little Miss was tucked up snug and warm in the Connecta sling and eventually went to sleep. This afternoon we went into town to see Father Christmas switch on the Christmas lights. This is my favourite bit of the Christmas lights. This is called the Tree of Joy and is the tallest of it’s kind in Europe and it is situated on the biggest roundabout on the island. It is run by the Rotary Club and enables islanders to donate a gift to a child in need. 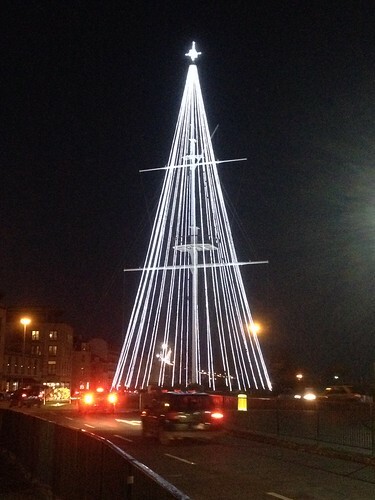 I just love how beautiful it looks on the skyline of St Peter Port. After The Little Mister woke up from his nap he told me that he wanted to “cuggle babby. They sat for ages like this and every now and then The Little Mister would lean down and, rather distractedly, kiss her on the top of her head. 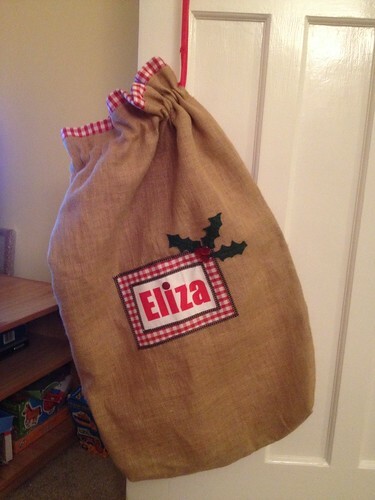 I have been making Christmas sacks for my children and my niece and nephew. They are taking me ages because I keep getting interrupted by the baby or I feel knackered by the end of the evening! I have managed to get two done though and I am pretty pleased with them. 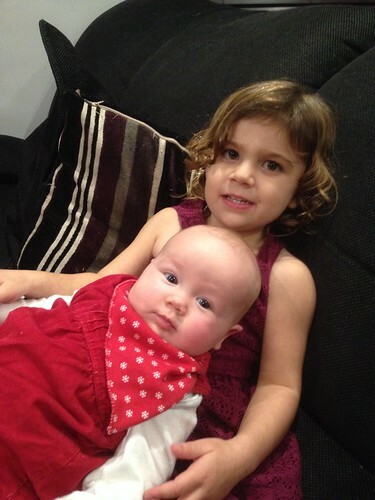 Here is my beautiful niece with The Little Miss. 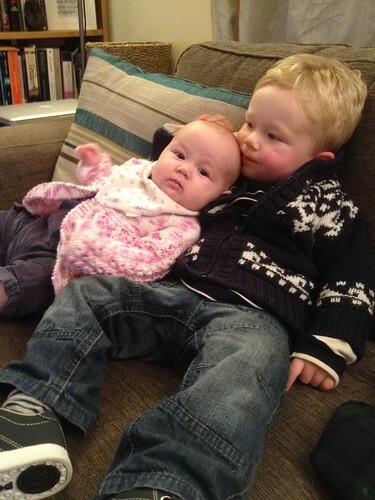 Eden was desperate to hold her the other day, and sat really well with her and kept kissing her on her head. Terribly sweet and I hope they grow up to be good friends. Today’s photo isn’t one I took or was even present for but I think it is a wonderful picture. 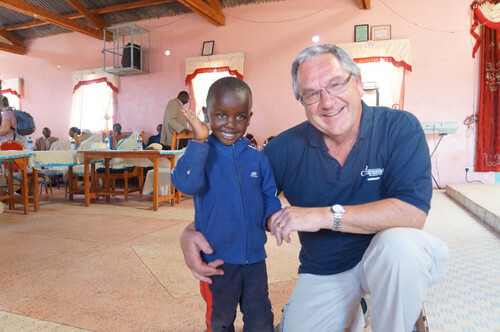 My Dad has been out in Kenya for the last week with Compassion UK, an organisation both he and my Mum were reps for. He has been out seeing the work that the projects do but he also made the decision to sponsor another child. This is him with his new sponsor child Paul. To read more about him and my Dad’s trip please follow the link to his blog here. The money that goes to support Paul and his family will completely change his life, something we are all capable of achieving through sponsoring a child through Compassion UK. I am so proud of my Dad, and I just love how happy he looks in this photograph. This afternoon the children and I took a walk to the local park. One of the features at the park is a Victorian Walled Kitchen Garden. This garden has been restored and replanted and is now a lovely example of a working kitchen garden. 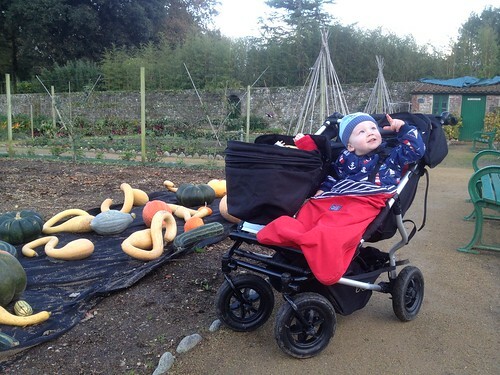 We found this unusual selection of squash and pumpkins. The Little Mister was more interested in the planes overhead! 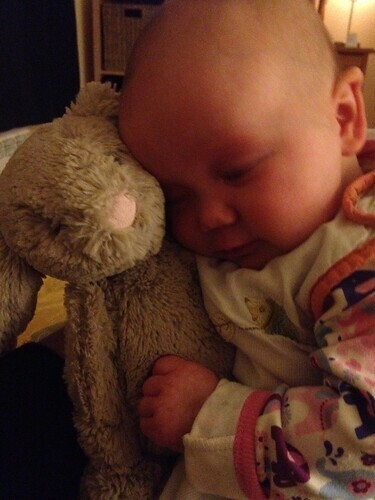 Ahhhh she loves her bunny! I love Jellycat toys. They are soft and fluffy and squidgeable and perfect for little babies. I know some people have already seen this photo but I didn’t really take any others today! So, thanks to all who came and spent. Your presence was much appreciated! 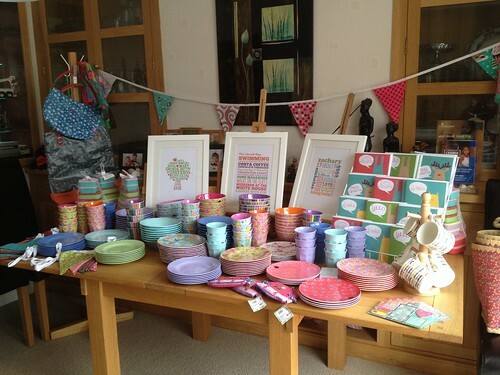 Tonight I have been doing a load of baking for a sale I am having tomorrow. 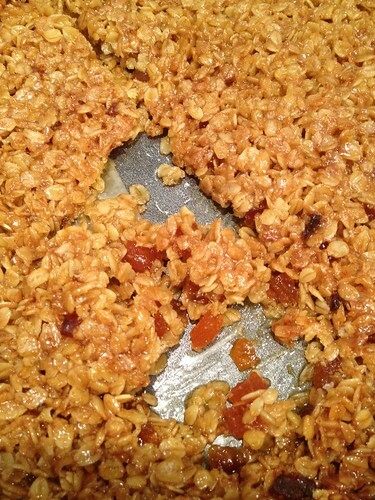 It generally went to plan other than the flapjacks which wouldn’t come out of the tin. In the end I gave up and hacked it out in a pile and made another one. Sometimes you have to know when you are beat!